Later today we should be getting a preview of 5-10 hotels that will be on IHG Rewards Club's newest PointBreaks list that should be bookable on Monday. Tomorrow we should have the full list. So it doesn't seem like coincidence that IHG has just released another 100% bonus on buying their points until November 3rd. Once you see the previews today or tomorrow you can decide if buying points is right for you and use them on Monday to get in on those amazing 5,000 points per night offers! Not only have they timed this to be right when PoinBreaks are coming out but they have lower the price of their points! 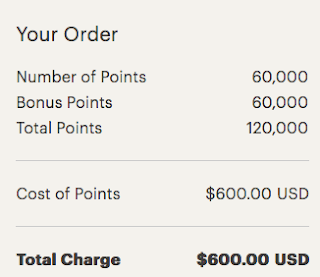 Last month buying 60,000 points (120,000 total with bonus) cost US$690 now the price is US$600! This means each point will only cost you 0.5 cents. That's 24 nights at IHG hotels if redeeming via the PointBreaks option which works out to only about C$32.00 per night! Since the bonus starts right at 5,000 points you could choose to buy only 10,000 points if you only 1 or 2 PointBreak nights or go for more!